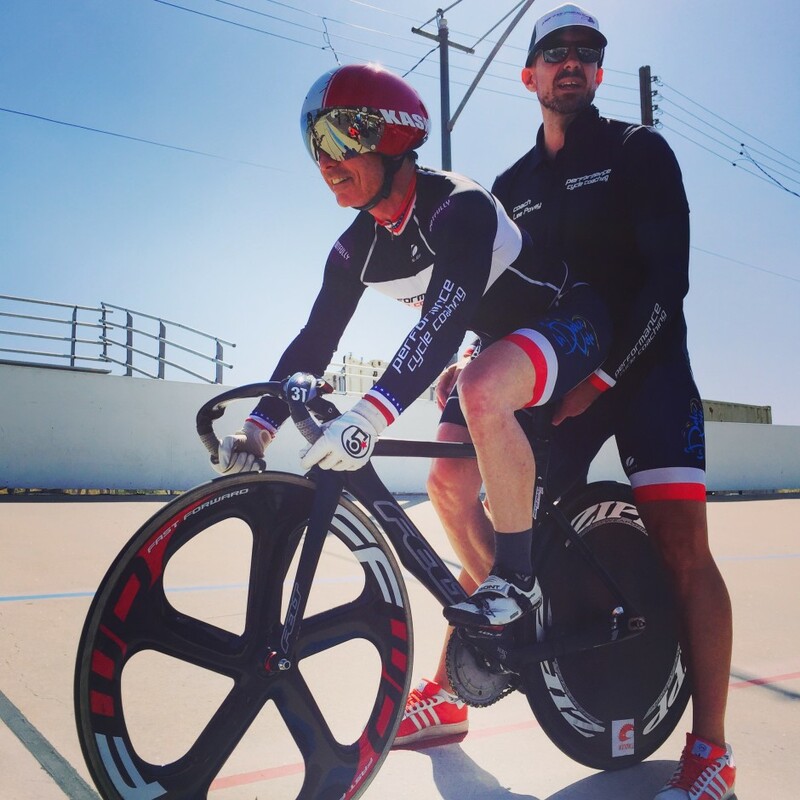 The 500m TT was my goal event for the 2015 season and I was less than thrilled to wake up and find how hot it was on the day as I don’t perform well under those conditions. Coach Lee was very helpful, and leading up to my event reminded me we should check my tire pressure and add some air if necessary. Upon inspecting my tires, we realized that I had a high pressure leak in my rear disc, and to make matters worse, at nearly that same moment, my hamstring muscle cramped up! To say that I was starting to freak out is an understatement!! Feeling stressed, I wasn’t in any state to race my bike well, and especially not for my target event. Coach Lee sensing my heightened anxiety, quickly and calmly “talked me off the ledge” all whilst taking care of my mechanical, grabbing a teammate who had just finished their event and swapping rear discs to get my bike ready to race. Lee continued to guide me back to a positive, focused mentality, and as I became more relaxed, I even notice my cramp subsided and I was feeling ready to for my event. Lee walked my bike and me up to the line, made sure the holders had everything lined up properly, and then took a step back, ready to encourage me for my effort. As the countdown began, my breathing naturally shifted to align with the tones and I settled right into the rhythm we had practiced so many times before. I nailed the start, exploding just as the timer hit zero, and I knew it from the moment I launched myself forward. All the way to the end of the 500m when I crossed the line, I was focused on holding the black line and always trying to accelerate, keeping the leg speed up and pushing through ‘til the end. I was delighted to hear the announced say my time, which was a new outdoor PB for me by about 2.4/tenths. Of course, as I came past Lee after my effort, he echoed the time of my new PB, with a smile, that told me he was very tuned into my goal, and me having just achieved it.